By Costa Maragos Posted: May 9, 2017 4:00 p.m. The stage is set for a major conference at the U of R and it will be a big stage, metaphorically speaking. 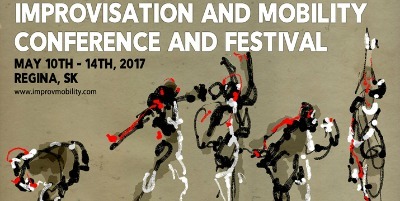 Welcome to The Improvisation and Mobility Conference and Festival May 10 – 14. The conference brings together a diverse array of artists to explore themes of improvisation and mobility. It will include lectures, roundtables, performances, including music, movement and spoken word and more. Presenters from the U of R as well as across Canada, and special guests from the UK and US, will attend the conference. The event is the culmination of the first four years of the Regina Improvisation Studies Centre (one of six such centers in Canada) located on campus. 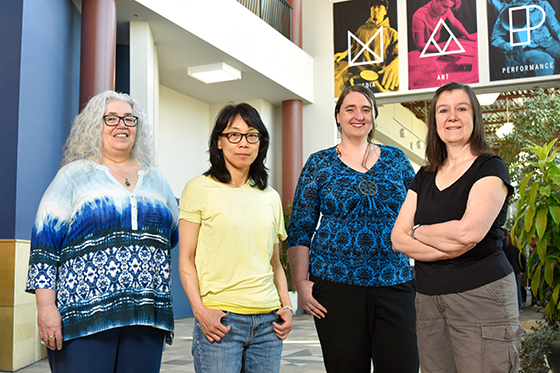 “This event gives us a chance to show off the incredible work being done by our researchers, graduate students and community partners at the Centre, exploring improvisation and its social and cultural impact,” says Dr. Rebecca Caines, associate professor in Interdisciplinary Studies in the Faculty of Media, Art, and Performance and conference coordinator. Collaboration is a key theme here. For example,the Centre’s research into improvisation blurs the lines here between Media, Arts, and Performance; and Computer Science and Engineering. It’s an area of study that is gaining momentum and is having an impact on the community. “Over the past four years the Centre has partnered on a number of different art and research projects with us, exploring topics as diverse as live painting and community-based visual art mentorship, improvisation with iPads for health and cultural development, theatre improvisation and FASD, and experimental improvised music in schools,” says Caines. One of the conference highlights is a project, bringing over 110 grade 7 and 8 students to campus to learn about improvisation. Local artist, Daya Madhur, who earned her Bachelor of Music Education at the U of R, and graduate student Clinton Ackerman have been working with two schools, George Lee and Connaught, to build a project on the theme of culture and identity, using improvised theatre, dance, and music, that will be shown as part of the conference. The students will also attend workshops in hip-hop improvisation, dance improvisation, and improvised poetry. For more information on the festival and presenters please visit here. This event was made possible thanks to support from the Canada Council for the Arts, International Institute for Critical Studies in Improvisation, Social Sciences and Humanities Research Council of Canada, The Faculty of Media, Arts, and Performance and the University of Regina. Caines was a co-applicant on the 2.5 million dollar Social Sciences and Health Research Council funded partnership that helped created The International Institute for Critical Studies in Improvisation. The Regina office is operating under that grant.